Mailgun is an email automation engine trusted by over 10,000 website and application developers for sending, receiving and tracking emails. 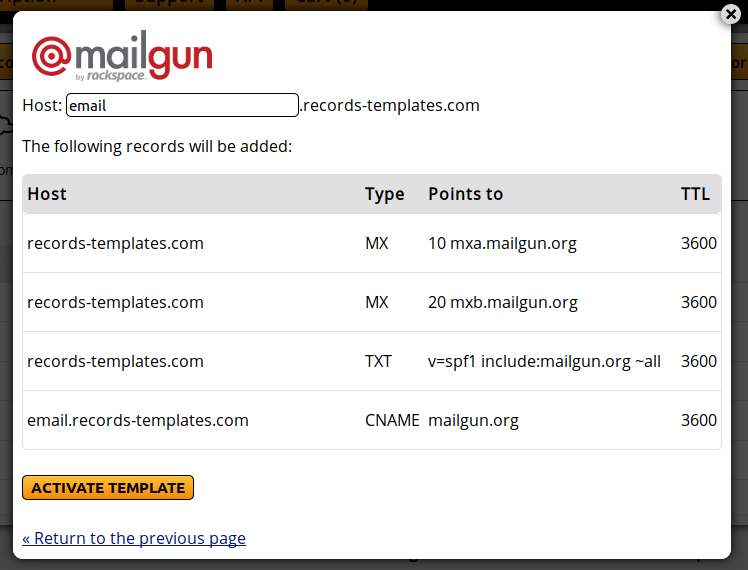 One of the easiest ways to use our services and Mailgun is using our Records Templates. They allow you to create the necessary records in your Master DNS Zone. In your ClouDNS account, you need to create a Master DNS Zone. If you do not know how to do it, you can check it here. When you are ready with creating your Master DNS Zone, go to your DNS Zone Control Panel and find the "Records Templates" button, located between "SOA settings" and "Cloud domains" buttons. Click on it. From the orange boxes, click on "Mailgun". When you click on the "Activate template" button the records will be added to your zone and the template will be activated. You can edit those records afterwards.